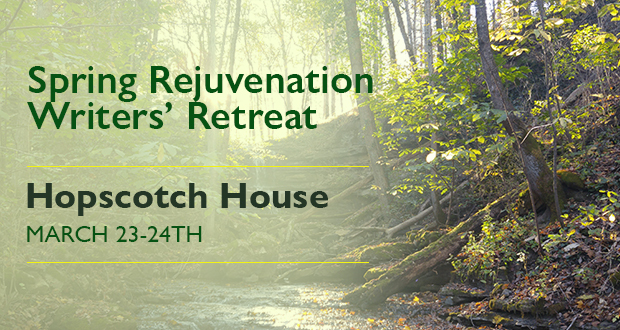 Join us at the Women Who Write’s Spring Rejuvenation Writers’ Retreat at the Hopscotch House Retreat and Residency Center on Saturday, March 23rd at 10 am thru Sunday, March 24th at 3pm. Come for a few hours, spend the day, or register as an overnight guest (accommodations are limited to 9 guests). Bring your writing project, enjoy the outdoors, and socialize with old and new friends who share your same interest. This is a MEMBERS ONLY event. Please bring either a breakfast item or side dish to be shared for a pot luck dinner, and a bag lunch if you would like. **A NOTE ABOUT GPS: Not all GPS systems will direct you to the correct driveway. If using GPS, please use it only to direct you the general area and then look for the driveway with mailbox 8221. If you get lost while on the property, please stop where you are and call (502) 439-4486. From Cincinnati: Take exit I-71 onto I-265 North (Gene Snyder Freeway/Hwy 841) and follow instructions below. From Lexington: Take exit I-64 onto I-265 North (Gene Snyder Freeway/Hwy 841) and follow instructions below. From Bowling Green: Take exit I-65 onto I-265 North (Gene Snyder Freeway/Hwy 841) and follow instructions below. From I-265/Gene Snyder Freeway/Hwy 841: Follow I-265 North until it ends at Hwy 42. Turn left. Go to first stoplight at top of hill and turn left onto Wolf Pen Branch Road and follow directions below. From Downtown Louisville: Take I-71 north toward Cincinnati to I-264 (Watterson Express). Exit I-264 onto Brownsboro Rd. Turn left onto Brownsboro Rd. pass Holiday Manor shopping center on right, go through the light at Lime Kiln Ln. and head toward Prospect. Go through light at Seminary Drive. Take right at next light onto Wolf Pen Branch Rd. Once you are on Wolf Pen Branch Rd: Go approximately .5 mile and take a left at the 4-way stop at Green Springs Subdivisionto continue on Wolf Pen Branch Road. Go approximately 1.5 miles, come to stop sign at Wolf Pen Branch and Spring Farm Road; take left to continue on Wolf Pen Branch Road. Follow for .75 of a mile and take a left onto the driveway at 8221 Wolf Pen Branch Rd. Cross the creek, go up hill and follow drive about 1/2 mile. Stay on the paved driveway. If you end up on gravel, you have gone the wrong way! Hopscotch House is the large yellow farmhouse on the right surrounded by black fencing. Park by the front of the house or towards the grass on the carport side. PLEASE ONLY PARK IN THE CARPORT TO UNLOAD YOUR CAR. Please complete the registration by Monday, March 18th, 2019. We look forward to seeing you. Any questions, email info@womenwhowrite.com.